PLAYTIME is celebrating its fifteenth year in business and is proud to be trusted by major brands to bring their image to life in over 45 countries worldwide. Experts in play area design, Founder and Creative Director Jon Norby and 3D designer Shane Duerksen report on the evolution of design. 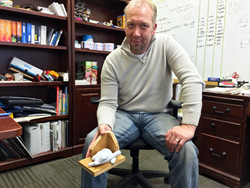 PLAYTIME Founder and Creative Director Jon Norby holds a maquette model of a Looney Tunes character's hand. Norby and his design team have created thousands of custom-themed play areas worldwide. Family-friendly businesses that want to stand out hire PLAYTIME to create powerful play experiences. Our commercial playground equipment and themed soft play areas are designed to engage children, drive traffic and enhance our customers’ brands. PLAYTIME is celebrating its 15th year in business and is proud to be trusted by major brands to bring their images to life in over 45 countries worldwide. Family-friendly businesses that want to stand out hire PLAYTIME to create powerful play experiences. Our commercial playground equipment and themed soft play areas are designed to engage children, drive traffic and enhance our customers’ brands. With over 25 years of art and design experience, PLAYTIME’s Founder and Creative Director Jon Norby is the leading expert in the field of play area design. Mr. Norby works with a talented staff of over 20 graphic designers, 3D artists, illustrators and craftsmen. Together, the PLAYTIME team has over 100 combined years of experience and has designed over 1,000 play areas worldwide. Jon and Shane Duerksen, lead 3D designer, report on the evolution of design in commercial play areas. 1. What has changed the most since you started PLAYTIME? Shane Duerksen: When PLAYTIME first started, I worked all around the shop helping out where needed. As the company grew, I took on the role as Lead Sculptor, sometimes sculpting with a chain saw. When PLAYTIME transitioned to 3D in 2010, I was tapped to design and develop 3D elements, which is amazing because I’m still sculpting and painting only it’s digitally. 2. What has been your biggest challenge at PLAYTIME? Jon Norby: Our biggest challenge is to communicate and evolve our design leadership role in the industry. We've been able to do that through continually challenging the way we do things. Sales, design, project management, and manufacturing all have made improvements over the years that have helped us stay relevant. It’s a continual process that can never stop. 3. How/where do you get your inspiration for new designs? Jon Norby: It starts with imagining what would be fun for a kid. Then what would be fun to design. It’s a collaborative process. We bounce ideas around and challenge ourselves as a team to create something extraordinary and unique for each location. If we create a truly imaginative and immersive environment, it will inspire children as they play. The play pieces are props—springboards from which children create their own adventures. What’s neat is that all our designs are built in soft, safe environments where kids can take risks and learn to move, whether from pulling up from crawling as a baby, to jumping and sliding down face first as a toddler. These personal accomplishments build self-esteem, and kids prefer designs that don’t look obvious – like sliding down a dinosaur tail or a curved banana. Shane Duerksen: Mostly from nature and craft beer. I’ve always enjoyed painting and sculpting animals so PLAYTIME is a natural fit for me. 4. How has the design process evolved over the years? What are some of the new tools you use? Jon Norby: From laborious hand drawing and sculpting mini maquette models, we’ve evolved to digitally designing, sculpting and painting. We now create the entire environment in 3D, including existing architectural structures. The design department has now switched to a new suite of 3D software applications, which has greatly improved our designs and our visual communication with customers and production. Production continues to impress with advancements in coatings and most other processes. I look forward to seeing what we can accomplish with more CNC work and 3D sculpting technology. Shane Duerksen: 3D has really streamlined our workflow, not only in output, but the overall quality is so much better, which is important when we have to communicate clearly with the production team. I’d have to say that the 3D fabrication technology is one of the greatest new tools we use in sculpting. Before, we projected and hot-wired the sculpted elements by hand. 5. What are you most proud of during your time here at PLAYTIME? Jon Norby: I’m most proud of the fact that we’ve never been satisfied with our success. We’ve continued to innovate and improve our designs. There’s a lot to be proud of, but I think some of the best play areas we’ve done include the Warner Bros. areas, the dinosaurs at Cherry Creek, Lotte World’s play area, and the one at Samsung Everland. Shane Duerksen: I’m proud of our OSHA safety track record in our studios. And I’m just really proud I get to work as an artist with great people for a great company like PLAYTIME.